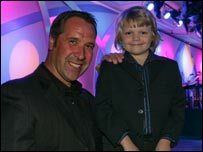 Oliver Dillon is a talented actor and recognised as the voice of 'Lumpy the Heffalump' in Disney's cartoon. But what many of his audience do not know is that Oliver, aged nine, also has cystic fibrosis (CF) - a life-threatening inherited genetic disease which disrupts, among other things, the way the digestive and respiratory systems work. Oliver's mum Alison, said her son loved the escape acting offers him. "When he was asked what he loved about being in the studio he said he forgets about the CF." 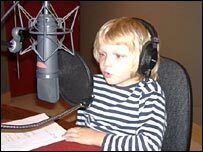 In between trips to the CF clinic, Oliver has now recorded 20 episodes of 'My friends Tigger and Pooh', has signed up for the second series which he starts recording in September and has completed the DVD, 'Pooh's Super Sleuth Christmas Movie,' which comes out in November. Alison said her son, who was first diagnosed at 12 weeks, became hooked on amateur dramatics through his grandparents. At school he took part in plays and happily sang in front of everyone and in 2006, Oliver enrolled in a drama school for three hours every Saturday morning and soon landed the role of Big Jule in the musical 'Guys and Dolls'. "When he was playing Big Jule at Yew Tree Theatre School I would go and give him his physio and nebuliser back stage and a quick high calorie snack to keep his energy up," said Alison, from Sevenoaks, Kent. "Oliver does keep well at the moment but that is only because of his rigid regime of twice daily physio sessions, nebulisers, huge doses of antibiotics, inhalers, pancreatic enzymes to help him digest his food properly and loads of exercise." For the first five years he had just three main infections for which he needed intravenous drugs. Although well at the moment Oliver is realistic about his condition and has recently switched agents to a voiceover specialist so that he can continue working even if he becomes sick. "He says one day he will make sure everyone knows about CF." Oliver was recently nominated for an award from the CF Trust for his achievements and although he did not win the judges were impressed him. Rosie Barnes, chief executive of the CF Trust said, "Oliver is a very special and talented little boy who wholly deserved his nomination." And she said the future is looking brighter for children like Oliver. "We have been instrumental in setting up specialist centres across the UK to ensure the care provided is second to none. "As a result, life expectancy for those with the disease is now better than ever, and many adults are living well into their 30's and even 40's. "We really do believe that there is a glimmer of hope on the horizon - we are closer than ever to finding an effective treatment for CF, using world leading gene therapy. This is a matter of time and effective funding." Dr Jim Littlewood, chairman of the Cystic Fibrosis Trust, agreed: "The outlook for these children is good. "The median survival is in the 40's, but it depends very much on the treatment they have. "There are a big number who are going to survive into middle-age. If we can just keep them clear of infections for the first ten to 15 years. "Children are getting diagnosed much sooner now and most are diagnosed within the first three weeks and this means we can start their treatments earlier."